The ongoing presidential race in the United States has revealed a number of phenomena that seem to have been brewing under the surface of neoliberal austerity economics for years. For one thing, it has shown a widespread popular discontent with the status quo. For another, it has revealed that the American public is no longer averse to socialistic ideas. The relative financial security of the “golden” years of the U.S. economy (late 1940s–early 1970s), along with the Cold War propaganda of the “communist threat to our lives,” had created a strong aversion to socialism in the American psyche. But the change in the objective conditions (precipitated largely by the switch from New Deal economics to Neoliberal economics) has led to change in consciousness. Evidence shows that the success of Sanders’ campaign has been not despite but largely because of his unabashedly professing to be a “democratic socialist.” This obviously means that, tired of the agonizing austerity economics, considerable segments of the electorate have come to view socialism as an alternative to Neoliberalism. Under the prevailing conditions that are clearly favorable to an alternative to neoliberal economics, a logical question to ask is: where are the labor leaders? Where are Messrs. Richard Trumka, president of the American Federation of Labor and Congress of Industrial Organizations (AFL-CIO), and his high-ranking labor lieutenants at the head of big unions? Why aren’t these influential labor leaders, representing 12.5 million union members, taking advantage of the popular anger to challenge the austerity economics of neoliberalism and chart an independent labor and/or grassroots movement that could lead to meaningful changes in favor of the working class and the broader masses of the dispossessed? Tragically, not only are the leaders of big unions not tapping into the rebellious popular mood to challenge the status quo, but they are, in fact, working very hard to contain rank-and-file workers not to vote for Bernie Sanders and, instead, vote for the candidate of the status quo, Hillary Clinton. This was clearly reflected, for example, in a recent confrontation between the Clinton-endorsing leaders of big unions such as AFSCME (public employees), the Service Employees (SEIU), the Food and Commercial Workers (UFCW), and the American Federation of Teachers, on the one hand, and the Sanders-supporting leaders of smaller unions, on the other. Tempers flared up when smaller unions challenged the Hillary-endorsing big unions. . . . Listening to the nurses union head speak out for Sanders’ strong pro-labor history, Lee Saunders, president of AFSCME, interrupted her, exclaiming: I ‘will not allow you to do a commercial for Sanders.’ She retorted, ‘You mean for the only candidate who has a 100% labor record?’ A union leader of postal workers charged the unions backing Hillary as being ‘completely out of touch with their workers.’ AFL-CIO President Richard Trumka then cut off their microphones. . . . Few union leaders allow a worker referendum to make the endorsement decisions. The 700,000-member Communications Workers of America (CWA) does, and the result was a decisive endorsement of Sanders . The volunteer Labor for Bernie grassroots drive is not just growing rapidly but cutting across all union categories and gaining support with non-union workers. . . . Typical of this exodus is Northern California Food and Commercial Workers Local 5, whose executive board voted 30 to 2 for Sanders, reflecting the views of most of its 28,000 members . Class collaborationist policies of the labor bureaucracy follow from a self-defeating philosophy that is called “national business unionism,” or “union-management partnership.” National business unionism accepts capital’s needs for profitability as a precondition for labor’s need for survival, advocates collaboration with the capitalist class on a national or nationalist basis, and shoulders the burden of onerous economic sacrifices to maintain corporate profitability. A major outcome of this policy has been the change of many unions into labor syndicates: they have turned into businesses that seek a share in the profits sweated out of the workers. For example, the United Auto Workers (UAW) is today a major holder of stocks in the Big Three automakers. Its income is tied to driving up the profits and stock prices of the companies at the expense of the workers. Its leaders forced an agreement on its members that included a six-year strike ban as part of the wage- and benefit-cutting contract dictated by the Obama administration’s Auto Task Force in 2009. The agreement also included curtailment of wages and benefits of new workers to about 60% of what auto workers previously made, elimination of overtime pay, and the policing of the shop floor by union representatives on behalf of the bosses. It is not surprising, then, that rank–and–file members no longer look to union leaders, “with their legions of six-figure-salaried officials and joint union-management slush funds, as instruments of struggle” on behalf of the working class . Bernie Sanders’ and Donald Trumps’ campaign successes have been largely by default: they have greatly benefitted from the fact that the discontented working people are passionately vying for change but their class-collaborationist leaders are trying to block change by supporting the candidate of the status quo, Hillary Clinton. How tragic, and what a shame: in the absence of an independent labor organization and agenda, the dispossessed and working people’s energy devoted to supporting Sanders and Trump is bound to either dissipate or serve others’ agendas. 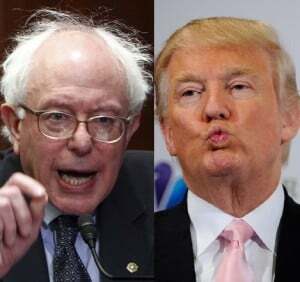 By channeling the popular outrage to further their campaigns, Trump and Sanders would inevitably end up channeling the energies and votes of their supporters to the Republican and Democratic parties. These candidates have been quite successful in stirring up the popular anger against the status quo. But they have also diverted attention from the main source of economic distress, inequality and injustice. While Trump blames ethnic, racial or religious scapegoats for the economic hardship of the largely white working people, whose long-cherished American dream has in recent years turned into nightmares, Sanders blames symptomatic manifestations of the capitalist system, Wall Street and/or big banks, not the system itself. And while Trump’s diversionary tactics of sanitizing the capitalist system by blaming its sins on immigrants and other scapegoats is, more or less, obvious, Sanders’ sanitization of the system is more subtle. Despite the fact that his moralistic condemnation of Wall Street, of inequality and of injustice is reasonable enough to attract millions to his campaign, it falls way short of a causal explanation of economic problems. The real culprit is the profit-driven system of capitalism, especially its recent developments and manifestation: neoliberal economics. Wall Street and/or big banks are of course products of capitalism. Sanders’ “exposition” of economic problems is, at best, half-hearted, at worst, obfuscationist. Many people applaud his courage to take on the giants of the Wall Street. But not many realize that in so doing, that is, in focusing on the effects of market mechanism, he tends to camouflage the cause, the systemic mechanism that gives rise to those giants. What is that mechanism, the mechanism that systematically transfers economic/financial resources from Main Street to Wall Street, thereby further enriching the rich and impoverishing the poor? Although expertly obfuscated and mystified, the planned or premeditated mechanism by which redistribution of economic resources from the bottom to the top takes place is fairly straightforward. The insidious mechanism of redistribution in favor of the financial oligarchy is benignly called monetary policy. Private central banks (such as the Federal Reserve Bank in the U.S.) are the main institutional vehicles that carry out the monetary policy of redistribution. Central banks’ polices of cheap or easy money benefits, first and foremost, the big banks and other major financial players that can outbid small borrowers who must borrow at much higher rates than the near-zero rates guaranteed to the big borrowers. By thus gaining privileged access to nearly interest-free money, the financial elites can enrich themselves in a number of ways. For one thing, they can snap-up income-producing assets at the expense of small borrowers who lack access to cheap money. For another, they can boost the value of their wealth by creating an artificial demand (such as stock buybacks) for those ill-begotten assets with the cheaply borrowed money. In addition, they can skim vast wealth by loaning out the cheap they obtain from central banks to everyone below the top of the wealth/income pyramid—at near four percent (mortgages), at seven or eight percent (auto, student and other loans), and above 15 percent (credit cards). This shows how the proxies of the financial oligarchy, ensconced at the helm of central banks and their shareholders (commercial banks), serve as agents of subtlely funneling economic resources from the public to the financial oligarchy—just as did the rent or tax collectors and bailiffs of feudal lords collected and transferred economic surplus from the peasants/serfs to the landed aristocracy. Instead of regulating or containing the disruptive speculative activities of the financial sector, economic policy makers have in recent years been actively promoting asset-price bubbles—in effect, further exacerbating inequality. It also shows that as long as this dynamic process of fostering the development of inequality and the rise of big business/big finance remains in place, no moral condemnation of Wall Street, of big banks and of social injustice, as repeatedly articulated by Bernie Sanders, would bring about meaningful economic relief to the overwhelming majority of the people. Nor would the actual break-up of big banks bring about the urgently-needed relief. For, breaking up a number of big banks while leaving the mechanism that precipitates the rise of big banks intact would be an exercise in futility: it makes little sense to fight symptoms without challenging the system that produces them. The fact that tens of millions of the discontented Americans are rallying behind Donald Trump and Bernie Sanders because these candidates claim to be anti-establishmentarians is a clear indication that the working class and other dispossessed masses are ready for radical changes. 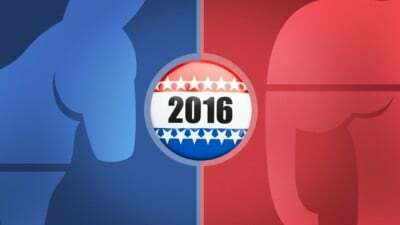 To challenge and (ultimately) change the status quo, however, the labor and other grassroots need to decisively break with the two-party system and the bureaucratic labor leaders. They need new politics and new organizations. What is needed to reverse the decline of labor and the living standards of the overwhelming majority of the people is a new type of union strategy and a new labor movement. Whatever the new labor organization is called (call it a party, a labor coalition, or anything you like), it has to be different not only from the U.S. business union model but also from the Social Democratic model of Europe: trade unions + party. Crucial as they are in the struggle for labor rights (the right to organize, the right to strike, and the right to bargain collectively), trade unions have their limitations in the fight against the vagaries of a market economy. For one thing, they encompass only a small portion of the working class. For another, trade unionist politics is usually limited to economic demands such as wages and working conditions. While critical to the economic welfare of union members, broader social issues such as democracy, economic justice, universal health, affordable education, and environmental concerns remain outside the purview of trade union politics. Many would argue that in the face of the escalating automation of the workplace, fierce labor rivalry at both national and international levels and the decline in the existing labor organizations projections of a new, anti-establishment labor movement sounds outlandish. Let us take a closer look at such pessimistic arguments. It is true that in the older industrialized countries the percentage of the labor force working in large manufacturing and mining enterprises has declined, compared to those working in the so-called service industries. But this is no more than diversification of the work force, which follows diversification of technology and economic activity. And the conclusion that it represents a decline in the overall weight or importance of the working class is unwarranted. The type of one’s work uniform, the color of a wage earner’s collar, or whether one’s pay is called wage or salary does not make one more or less of a worker than the so-called traditional “blue collar” workers. Indeed, statistics on wage and benefits of the work force show that, on the average, the so-called white collar workers are paid less and are much less secure economically than the traditional industrial/manufacturing workers. Growth of the service industries has also meant growth of minimum-wage and no-benefits workers. Concentration of large numbers of workers in telecommunications, transport, banks, hospitals, energy sector, and the like can today paralyze the capitalist economy as effectively as their “blue-collar” counterparts in the manufacturing sector. Furthermore, “professionals” and salaried employees such as teachers, engineers, physicians, and even middle and lower level managers are increasingly becoming wage workers, and are thus ruled by the supply and demand forces of the labor market. The tendency for wage work to become the dominant or universal form of work means that, overall, the ranks of the working class are expanding, not contracting, despite the relative decline in manufacturing employment . More numerous than ever before, the working class can influence, shape, and ultimately lead the world economy if it takes on the challenge (a) in the context of broader coalitions and alliances with other social groups that also struggle for equity, environmental protection, and human rights; and (b) on an international level. A logical response to globalization from above is globalization from below. In the same fashion that, in their fight against the working class in pursuit of profit maximization, the elites of the international capitalist class are not bound by territoriality or national boundaries, so does the working class need to coordinate its response internationally. Representatives of transnational capital and their proxies in capitalist governments routinely meet at international conferences in order to synchronize their cross-border business, implement global austerity measures and entrench neoliberal policies worldwide. These include the World Economic Forum in Davos, Switzerland, the World Bank and IMF annual meetings, the Periodic G20 meetings, the Aspen Institutes Ideas Festival, The Bilderberg Group annual geopolitics forum, and the Herb Allen’s Sun Valley gathering of media moguls—to name only a handful of the many such international policy gatherings. A commonsense, first step deterrent to transnational capital’s strategy of blackmailing labor and communities through threats such as destroying or exporting jobs by moving their business elsewhere would be to remove the lures that induce plant relocation, capital flight or outsourcing. Making labor costs of production comparable on an international level would be crucial for this purpose. This would entail taking the necessary steps toward the international establishment of wages and benefits, that is, of labor cost parity within the same company and the same trade, subject to (a) the cost of living, and (b) productivity in each country. A strategy of this sort would replace the current downward competition between workers in various countries with coordinated bargaining and joint policies for mutual interests and problem-solving on a global level. While this may sound radical, it is not any more radical than what the transnational capitalist class has been doing for a long time . If at an earlier stage of capitalist development “workers of the world unite” seemed an impossible dream articulated by the leading labor champion Karl Marx, internationalization of capital has now made that dream an urgent necessity. As capital and labor are the cornerstones of capitalist production, their respective organizations and institutions evolve more or less apace. Thus, when production was local, so was labor: carpenters, shoemakers, bricklayers, and other craftsmen organized primarily in their local communities. But as capitalist production became national, so did trade unions. Now that capitalist production has become global, labor organizations too need to become international in order to safeguard their rights against the profit-driven whims of the footloose and fancy-free transnational capital. [T]o describe the desired alternatives [to capitalism] as an equitable, democratic, and ecologically sustainable social and economic organization. But once one begins to attempt to spell out the concrete implications of this abstract ideal, one cannot avoid describing a system of social relations that checks or restrains the devastating logic of capitalism. . . . Whatever one wishes to call it, conscious cooperative organization must supplant both blind competition and monopolistic collusion as the strategic principle of production and exchange if the economy is brought back to its appropriate relationship to the community . The road to a social structure not regulated by capitalist profitability imperatives would be a long and tortuous one; it cannot be traveled in one jump, but rather through a series of transitional steps, programs and demands. Based on the needs of the working class and the broad masses of the dispossessed, such demands should start with realistic, concrete and simple bread and butter needs or issues. While the exact nature of transitional demands will depend on the concrete conditions of many specific movements along the way of this long struggle, the following seem to be some of the logical demands in most social contexts. 1. The right to employment for all those able to work. Employers and their representatives in government will obviously cry out at this demand that “there are simply not enough jobs.” The labor coalition can then respond by raising the following demand: a sliding scale of working hours, which means that the new international labor movement should correlate the length of the work week to labor productivity so that as productivity rises the number of working hours will automatically fall, and no jobs will be lost. If it takes less time to produce the same amount of goods and services, we should all work less rather than eliminating some people’s jobs. There is absolutely nothing outlandish or radical about this demand; it only makes sense. 2. A sliding scale, or indexing, of wages. This means adjusting wages to the rate of inflation so that workers’ purchasing power and their standard of living will not fall as prices rise. Closely related to this demand is the demand that the share of wages as a percentage of national income should not fall relative to the share of profit, rent, and interest. Studies of income distribution in the U.S. show that the relative share of capital as a percentage of national income has been steadily rising at the expense of the share of labor in the post-WW II period. 3. The right to a guaranteed universal health care and an affordable education system. These and similar demands such as the right to breath fresh air, the right to drink uncontaminated water, and the right to equal treatment of workforce regardless of race, gender and sexual orientation are certain to rally diverse segments of society behind the labor coalition, thereby paving the way toward the end of the status quo and the beginning of a superior civilization free from capitalist profitability imperatives . For more on the diversification of the labor force see, for example, Michael Zweig, The Working Class Majority, Ithaca, NY: Cornell University Press, 2012; Michael Yates, Why Unions Matter, New York, NY: Monthly Review Press, 2009; and Harry Braverman, Labor and Monopoly Capital, New York and London: Monthly Review Press, 1974. I have provided a longer discussion of these issues in Chapter 8 of my book, Beyond Mainstream Explanations of the Financial Crisis (Routledge 2014). Walden Bello, Dark Victory, London: Pluto Press, 1994, p. 114. Among the many labor advocates who have written on these strategies and demands, the term “transitional program/demands” is most closely associated with or attributed to Leon Trotsky who systematically formulated these strategies in his The Transitional Program for Socialist Revolution (New York: Pathfinder Press, 1977).